Manny Pacquiao concluded his training camp Thursday afternoon in Las Vegas, two days before planning to settle a score with Tim Bradley Jr. this Saturday at the MGM Grand Garden Arena in Las Vegas, Nevada. Pacquiao with head trainer Freddie Roach and assistant trainers, Buboy Fernandez, Roger "Haplas" Fernandez and Justin Fortune, spent the hot afternoon at the Top Rank Gym just outside of the Vegas strip and applied finishing touches on their two months of hard work that started early February. Boxer and trainer spent time with the mitts and pads in the ring, ironing out their final battle plan against the guy who stole his title away from him some two years ago. Pacquiao hammered his trainer's mitts with a flurry of punches that echoed throughout the gym. And while they are at it, Roach is seen and heard uttering instructions to his prized pupil that only the two of them can decipher. The eight time world champ was in a jovial mood all afternoon which was the picture of this camp that started at the boxer's own gym in General Santos City and ended Thursday here in Sin City. He played around Roach, Fernandez and Hernandez and a handful of observers at the gym. He was also performing layups and jump shots during the break of his routine in the ring - moves from his other love - basketball. 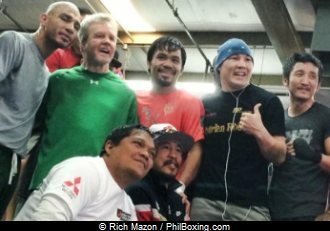 POWERHOUSE LINE-UP AT TOP RANK GYM: Cotto, Provodnikov, Zou Shiming and Ray Beltran are among Pacquiao's stablemates who pose for Pacquiao closing of his camp ahead of Pacquiao's highly anticipated rematch with WBO welterweight champion Timothy Bradley on Saturday night at the MGM Grand Garden Arena in Las Vegas. Photo by Rich Mazon. Later on, the rest of Roach's pupils from the Wild Card Gym in Hollywood slowly poured in the gym. Miguel Cotto, Ruslan Provodnikov, Zou Shiming and Ray Beltran greeted Pacquiao before they immersed themselves in their own respective trainings. 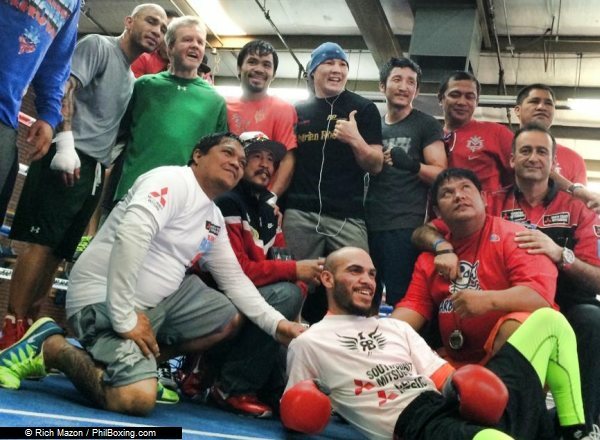 They even posed for a group photo which Pacquiao requested. Pacquiao ended his final training session with a routine of "cooling-down" exercises under the assistance of Buboy and Roger Fernandez. In 48 hours, all of Pacquiao's hard work will be put to a test against the reigning champion in Bradley Jr. whose physique showed that he also underwent a lot of hard work and training of his own. A decisive and satisfactory victory will be the reward for all their hard work.